From left to right: City Councilor Joseph Lucero, area resident Gwendolyn Bauer, Tree Board member Karyl Scarlett, and City Councilor Greg Gillaspie back fill the hole for the Cimarron Ash. Landscaping fabric that allows water to penetrate while deterring weeds covers the ground under the rock mulch. Alamosa has an island with trees. 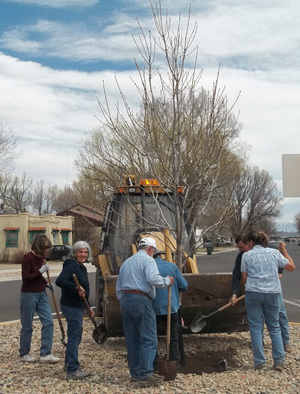 To celebrate Arbor Week this year, volunteers, Tree Board members and Alamosa City personnel planted six trees in the new island area at the intersection of State St and Cascade Ave. The Parks and Recreation crew dug the holes with a back hoe and placed the trees as they were too large to be easily handled by volunteers. Holes were backfilled and water basins formed under the direction of Soloman Archuleta and Jeremy Arellano. Area neighbor Barbara Kruse helped design the landscaping for the new island that was created when repairs were done to State St last year. 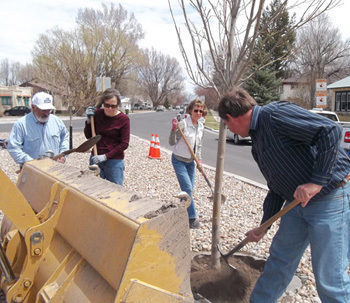 Following directions from Pat Steenburg, Alamosa Public Works, project goals included creating an attractive, low maintenance area that provides safe traffic viewing and drip irrigation. Prickly shrubs and trees were avoided as they gather plastic bags and other flying objects. Vegetation with small leaves and a lot of fruit litter was avoided to reduce upkeep. Rock mulch was used as it doesn’t blow in our high winds. Xeric shrubs and flowers will be added later in the season. The trees planted were Autumn Purple Ash, New Horizon Elm, Cimarron Ash, Canada Red Cherry, Spring Snow Crab, and Thunderchild Crab. Click for specific tree information (.pdf) and site layout (.pdf). 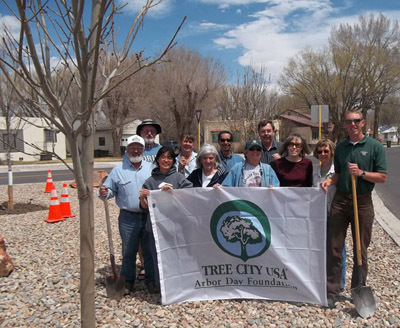 Alamosa has been a Tree City USA member for 23 years. Displaying the banner are from left to right: Joseph Lucero, Ron Loser, Audrey Liu, Barbara Kruse, Lena Lucero, Soloman Archuleta, Marilyn Loser, Greg Gillaspie, Gwendolyn Bauer, Karyl Scarlett, and Adam Moore. Gwendolyn Bauer, Lena Lucero, Joseph Lucero, Soloman Archuleta, Greg Gillaspie, and Barbara Kruse plant an Autumn Purple Ash.